HONK if your bike has more steel than a Shoplifters Anonymous meeting! This has to be the nicest resto-Raleigh we’ve had on the OTSG is a long time. This is Darrell Y’s 1973 Raleigh Competition. Look but don’t touch! This was my general concept for Compo: Build a Raleigh Competition with of the era components that complement, possibly even improve on the original. Vision: If I were the age I was in 1973 (22 years of age) would this be a bike that I’d really be proud of owning and riding? To add to that, this is what I think Raleigh might have built if they had offered a Campagnolo Gruppo option for the early seventies Competitions. There were several challenges to overcome, not the least of which was the Huret dropouts. I bought a bare frame on eBay to build the project. I decided to stay with the 27 inch wheel format and used components mostly from the seventies and early eighties. It’s easy to do ol’ school, when you are ol’ school. Darrell, you did a great job on the restoration, with a very nice selection of components. Love it! Here are more of the bikes in my stable. Beautiful job, Darrell! Very nice collection! Not merely an OTS, but a bona fide ADDGOTTOTS (Absolutely Drop Dead Gorgeous Over The Top Old Ten Speed)! Beautiful! I would be proud to ride this bike at 22 or 82 (unfortunately, I’m closer to the latter). And this is most certainly what Raleigh would have built; in fact, they pretty much did a few years later with the Competition GS (GS for Gran Sport). 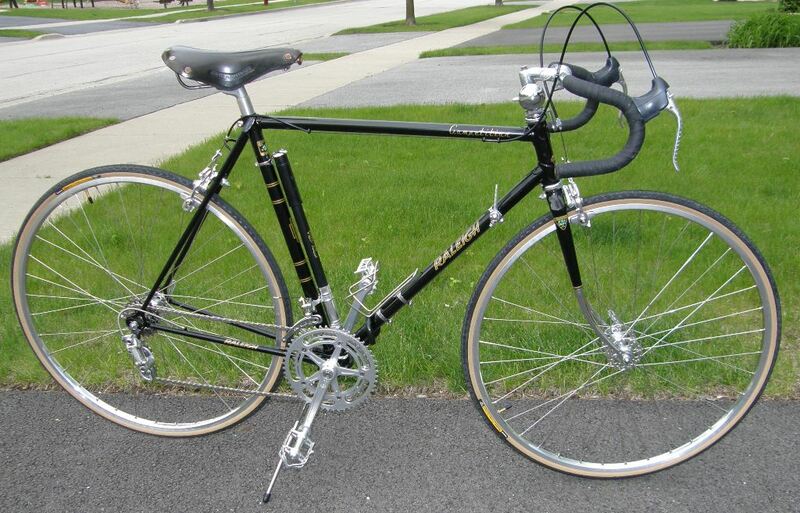 See Mark G.’s lovely 1980 Raleigh Competition GS for comparison. I actually just picked up an almost identical Competition GS with original parts for my next project. I was just going to shine it up the best I could, but now that I see yours with its powdercoat and new decals, I’m thinking maybe I should redo the paint. Will the madness never stop?! I hope not. Great bike, great job. I almost forgot. How did you preserve the chrome on the forks? Did you redo it? Were the stays originally chromed, too? What was the issue with the Huret dropouts? That is one of the best looking vintage Raleighs I have ever seen. Very well done Sir. HUGH! WHERE YA BEEN GOOD BUDDY? How’s the summer flip season treated you? Wow! What a nice job, I am really inspired to start on my ’71 Super Course, you’ve set the bar very high.